MMO-3 Synthesizer Review - Digital Synthesis Refreshingly Different! HomeReviewsHardwareNozoïd MMO-3 Synthesizer Review – Digital Synthesis Refreshingly Different! Analog or digital? What sounds better? Musicians will discuss this topic also in the coming years. Nonetheless, the Nozoïd MMO-3 Synthesizer showed clearly in the test phase that he has a very versatile digital sound. Yes, it sounds very digital but that has a lot of charm and character here. However, the synthesis is not comparable with the classic Yamaha DX7. Here, FM synthesis is combined with west-coast sound approaches. Because of this, it’s a Synthesizer with a very unique character. Beautiful percussive FM sounds, fat soundscapes as well as unusual harsh and dirty timbres are here possible. Above all, the MMO-3 Synthesizer fits perfectly into the experimental music world. 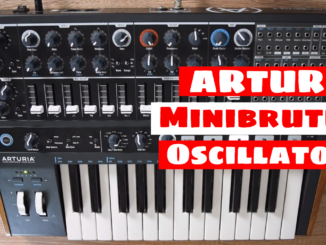 Due to its many modulation options, you can create very quick complex and crazy sounds. If you want to produce classic synth sounds, you should not take the MMO-3 in the shortlist because the sounds are very special. I personally like the sound very well as I’m always looking for new unusual sounds. 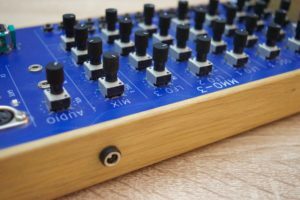 Cold, glitchy and noisy, the MMO-3 is not the king for warm sounds but perfect for such digital sounds that you don’t want to find in classic analog synths. The fact that you can not use a filter makes the instrument very exciting. His sound is very unpredictable and different in my opinion. During the last months of 2017, I was able to test the MMO-3 Synthesizer more closely. He was able to convince in the test of the sound possibilities. This is mainly because of the very own and unusual sounds. Above all, I had a lot of fun with making drones and soundscapes that sounded very beautiful cold and dirty. The features (FM, AM, PM, …) of the MMO-3 could satisfy me because this instrument shows a nice different side of Synthesizers. The interface of the synth could not convince me completely. It’s certainly refreshing to see a different approach to an interface. The idea to have everything under his finger is great but unfortunately, the whole thing was not developed to the end. Here is missing in my opinion a small display that gives you feedback about all parameters, modulations… If you program complex sounds, you can quickly lose track of what you modulate. So it’s helpful to take notes on a sheet what you did with the interface. Also, one could improve the material / quality of the knobs. In my test device, these ware made of foam which in my opinion does not have the perfect grip and feels a bit cheap. The overall processing of the MMO-3 is to be seen as positive because the device is very light and therefore very easy to transport. The wooden side parts are a good contrast to the blue panel and give the device a nice design. Often, the search for a new Synthesizer begins at the well-known companies such as KORG, Roland, Moog Music, Yamaha, etc. The test of the MMO-3 shows clearly in my opinion that you should also spread your search beyond the big known companies. Here you can find electronic music instruments with unique concepts or designs such as the MMO-3 from Nozoïd. He can score with a very own sound character that is very digital and cold. With its wide selection of sound shaping possibilities, a lot of different sound timbres (clear, distorted, noisy, glitchy…) are here possible to achieve. The MMO-3 is not only a perfect drone Synthesizer but makes also a good figure in combination with notes (arpeggiators, sequences…). The MMO-3 is an exciting Synthesizer that is refreshingly different and difficult to place in one specific area. It’s an instrument for sound designers and less for big players, because of it’s monophonic engine. It’s a great way to discover new sound worlds you might not have known before. For a price of 499€, buyers get a digital monophonic Synthesizer that is difficult to compare with another device. If I had to name a device that comes close to the MMO-3, then it’s the Make Noise 0-Coast but just because of the concept. 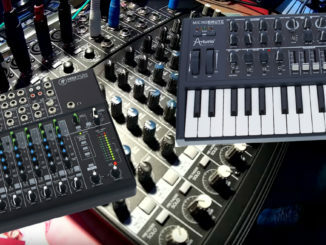 In conclusion, one can say that even if the big companies increasingly uses known structures (subtractive, classic FM synthesis…), there are still unique Synthesizers that can score with complete different concepts. The Punk scene of electronic instruments! How To Use A Mackie Mixer As A Synthesizer? Italo Brutalo Answers The Question! 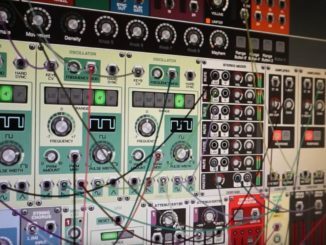 Voltage Modular Software Synthesizer Now Available For PC & Mac!